From New York Times and USA Today bestselling author, Tricia O’Malley, comes a brand new series about love, self-discovery and embracing your inner mermaid. She shouldn't be on this island. If she was smart, Samantha Jameson would turn around and march right back to the plane that deposited her at a faded hut of an airport on Siren Island. Yet, Samantha just can't muster the energy to do so, not after the hellish week she's had. Her whole life has been spent playing by the rules, and for what? An empty apartment, a career with no upward movement, and one failed relationship after another. When it all blows up in her face, what's a girl to do but book a last-minute trip to the ridiculously named Laughing Mermaid Bed & Breakfast on an unknown speck of an island in the Caribbean? Lucas Mosteron knows all about burning out from first-hand experience. Over the years, he's discovered that he isn't the only one, as everyone has their own unique story for landing on Siren Island. His lovely and mysterious neighbors at The Laughing Mermaid Bed & Breakfast are no exception. Little does he know that there is more to their story than he could ever have imagined possible. When Samantha Jameson arrives as their guest - depleted and needing respite, Lucas can't help but feel like he could be the man she needs. 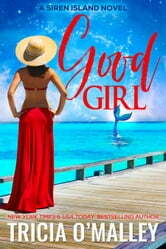 Irresistibly drawn to her uptight demeanor, Lucas is determined to unwind Samantha and show her that life on Siren Island could be the answer to all her problems. "Oh my gosh!!! This book is amazing! I LOVED everything about this book. The message it sends to the readers. I think so many people will be able to relate to Samantha. How the people on the island become her family and she finally lets go of everything toxic in her life." "You’ve got a gem here! Great story of self discovery in an awesome location with magick thrown in." "Oh my gawd...I adore this new series!!" "You outdid yourself, I just loved it!!! Such a wonderful new story." "I give a standing ovation. I loved everything about this story"
I just love this author. A greatly enjoyable start to what is going to be another great series. Cant wait for the next episode to come out. I loved the book. Just had to finish it and can't wait for #2 ! Loved the first in this new series! A great read, a woman finds herself, love and magick.....all rolled into one! Having read the Tequila books, delighted to see another series by this author. Light and readable, just the thing to settle down with to while away a few hours. Think I must download the Irish books next. What a great love story. About love, magic, family and work, which will Sam choose? I knew she'd make the right decision. Really makes you want to visit a tropical island and have your own adventure. Looking forward to book 2 ! !